The Governor of the State of South Carolina is the head of state for the State of South Carolina. Under the South Carolina Constitution, the governor is also the head of government, serving as the chief executive of the South Carolina executive branch. The governor is the ex officio commander-in-chief of the National Guard when not called into federal use. 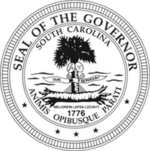 The governor's responsibilities include making yearly "State of the State" addresses to the South Carolina General Assembly, submitting an executive budget and ensuring that state laws are enforced. 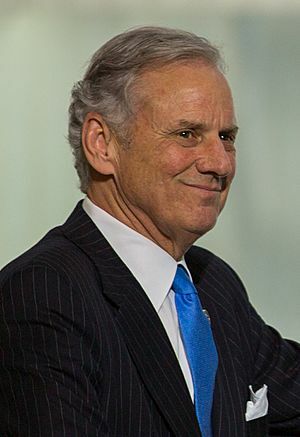 The 117th and current Governor of South Carolina is Henry McMaster, who serving the remainder of Nikki Haley's second term after she resigned as governor on January 24, 2017 to assume office as United States Ambassador to the United Nations. There are three legal requirements set forth in Section 2 of Article IV of the South Carolina Constitution. (1) Be at least 30 years of age. (2) Citizen of the United States and a resident of South Carolina for 5 years preceding the day of election. The final requirement, (3) "No person shall be eligible to the office of Governor who denies the existence of the Supreme Being," is of extremely doubtful validity in light of the 1961 Supreme Court decision Torcaso v. Watkins, which reaffirmed that religious tests for public offices violated the Fourteenth Amendment to the United States Constitution. This requirement, however, has still not been removed from the Constitution of South Carolina. If all three are unable to be governor, then the General Assembly will elect a new governor. During impeachment or when the governor is temporarily disabled or absent from office, the lieutenant governor will have the powers of the governor. If the governor elect is unable to fulfill the duties of the office of the governor, the lieutenant governor will become governor when the incumbent governor's term expires. If there is an incumbent governor beginning a new term, but a lieutenant governor-elect, and if the incumbent governor is unable to fulfill the duties of the office of the governor, the incumbent lieutenant governor shall become governor until the inauguration date, and the lieutenant governor-elect shall become governor on that date. Should the Lieutenant Governorship become vacant, the President Pro Tempore will immediately become Lieutenant Governor. Should the Governor be unable to fulfill his duties, the Lieutenant Governor must become Governor. If he refuses, he must resign as Lieutenant Governor. Likewise, this applies to the President Pro Tempore and the Speaker of the House. In January of 2017, Hugh K. Leatherman Sr., the President Pro Tempore, refused to ascend to the Lieutenant Governorship. Leatherman resigned as President Pro Tempore to avoid becoming Lieutenant Governor but won his seat back the following day. "I do solemnly swear (or affirm) that I am duly qualified, according to the Constitution of this State, to exercise the duties of the office to which I have been elected, (or appointed), and that I will, to the best of my ability, discharge the duties thereof, and preserve, protect, and defend the Constitution of this State and of the United States. So help me God." The Governor's Mansion, located at 800 Richland Street in Columbia, on Arsenal Hill, is the official residence of the Governor of South Carolina. It was built in 1855 and originally served as faculty quarters for The Arsenal Academy which together with the Citadel Academy in Charleston formed The South Carolina Military Academy (now The Citadel); The Arsenal was burned by Sherman's forces in February, 1865 and never reopened; the faculty quarters building was the only structure to survive and became the official residence of the governor in 1868. The South Carolina Constitution in Section 20 of Article IV requires that the governor is to reside where the General Assembly convenes. The South Carolina Constitution of 1776 specified for the governor (known as the president) to be chosen by the General Assembly. In 1778, the constitution was amended to change the title for the chief of the executive branch from president to governor. A new constitution was promulgated in 1865 following the capture of the state by the Union Army in the Civil War. It called for the direct election of the governor, but continued to limit the vote to white males. On October 18, 1865, James Lawrence Orr was the first Governor of South Carolina to be elected by popular vote. Following the state's failure to adopt the 14th Amendment to the United States Constitution, the US Congress eliminated all offices of state government. A temporary military government headed by Edward Canby was set up until new elections were held after the writing of the Constitution of 1868. All male citizens above the age of 21, regardless of race, were given the right to vote and the governor was allowed to be elected to two consecutive terms. The election of Ben Tillman in 1890 to governor by the support of agrarian reformers forced a new constitutional convention to be held. The constitution of 1895 instituted a poll tax and also required voters to pass a literacy test, conditions which were much later held to be unconstitional by the Supreme Court of the United States (and in the case of the poll tax, banned altogether by federal constitutional amendment It did increase the governor's powers by granting a line-item veto on the budget. In 1926, an amendment to the constitution was passed that lengthened the governor's term to 4 years, but prevented consecutive terms. Governor Richard Riley pushed for an amendment to allow for two consecutive terms and it was passed by the voters in 1980. US Ambassador to the United Nations: South Carolina governor Nikki Haley was confirmed on January 24th, 2017 by the United States Senate as the 29th US Ambassador to the United Nations. The vote was 96 to 4. She was succeeded in office by Henry McMaster, who had been lieutenant governor. Governor of South Carolina Facts for Kids. Kiddle Encyclopedia.